Planning for a long Vacation or Preparing for a Business trip? The travel preparation can sometimes be challenging for People Living with HIV (PLHIV). Carry your HIV medications with you on Board rather than checking them in and have a memo from the prescribing doctor’s memo with you. The contents of the memo should confirm that the medication is necessary during the trip. It does not need to discuss HIV and can state the medications are for a chronic medical condition and for personal use. It is also advisable to have the medication’s original packet/ Bottle, showing the name of the person carrying the medication and medication details. You Don’t Need to Discuss Your HIV Status! When crossing international borders, one might be questioned on the medication carried. Preparing for these questions can facilitate an easier border crossing experience. HIV need not be discussed or Revealed and that these medications are for a chronic health problem can be Reiterated. Discuss with your doctor dose timing adjustments when travelling across different time zones. Medication can usually be taken one or two hours later for a number of days until the timing fits with the destination country. The process should be reversed on return. Missing medication doses should be avoided at all cost. Treatment breaks should be avoided unless discussed with your doctor. If you are travelling in and out of Singapore and need advice on HIV treatment or testing, At Dr. Tan & Partners, we provide a safe and discreet environment for testing. You can find out more about Anonymous HIV Testing. Killed or inactivated vaccines do not represent a danger to immunocompromised people and generally should be administered as recommended for other people. 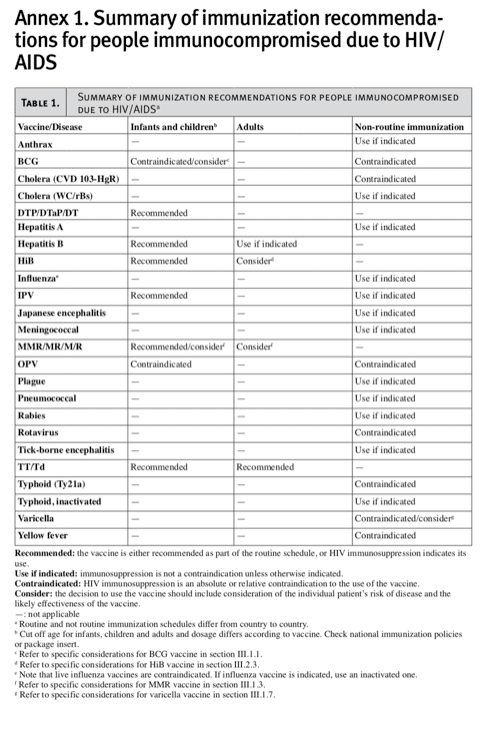 The main vaccinations we recommend for PLHIV besides the country-specific vaccinations are. It is imperative to bring enough medication and slightly more for a few days as getting a prescription or purchasing your medications in a foreign country may not always be possible. Furthermore, there is no way to ascertain whether the purchased medication might be of the same quality, type and efficacy. If you are travelling with a partner/s who are not HIV positive, you can find out more information on getting PrEP (Pre Exposure Prophylaxis) for their protection as well – Non-HIV partners for HIV PrEP.